Mary Caraccioli, MBA, is an EMMY™ award winning financial journalist who has hosted and/ or produced programs for ABC, CNBC, FOX and Comcast. Mary’s track record for creating award-winning programs for broadcast, cable and digital mediums has led to her current assignment. She is currently the Chief Communications Officer for the Central Park Conservancy. In this role, Mary is responsible for the direction and leadership of the Conservancy’s marketing, public relations, and internal communications across all platforms, and messaging for all institutional initiatives, programs, and events. 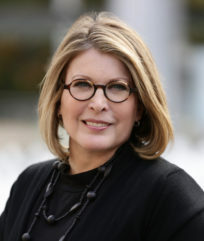 Prior to joining the Conservancy, she served as Chief Communications Officer at Lincoln Center for the Performing Arts, and worked as a reporter, broadcast anchor, and news executive at a variety of media outlets, including ABC, CNBC, FOX, Comcast, and Al Jazeera America. Mary’s financial journalism career started at CNBC, financial TV’s industry leader. She later helped renowned business broadcaster Lou Dobbs, launch his nationally syndicated radio show The Lou Dobbs Financial Report and worked for several years as its lead content producer. Mary also created EMMY award winning live shows Good Day Philadelphia on FOX-TV, Money Matters Today for Comcast and two money themed programs for the ABC TV station group and ABC’s LiveWell TV network. She is the founder and lead contributor of the respected personal financial website TheMoneyConfidante.com. She has been quoted in O magazine, Parade, Parenting, Inside Edition and many other national and local media outlets. Mary’s work as a communications expert has helped Fortune 100 companies and university clients achieve high level results across platforms and face to face. Mary is a member of the Advisory Council of the Global Interdependence Center, and the Delaware Financial Literacy Institute, one of the nation’s most comprehensive financial literacy non-profits. Mary has earned an MLA from the University of Pennsylvania and an MBA from Drexel University’s LeBow College of Business and BA from the University of Pittsburgh.